Victor Israelyan was a senior ambassador in the Soviet Foreign Ministry when the armies of Egypt and Syria invaded Israeli-occupied territory on October 6, 1973. Critical to the outcome of this conflict were the Soviet Union and the United States, whose diplomatic maneuverings behind the scenes eventually ended what came to be known as the Yom Kippur War. During the crisis, however, tensions between the superpowers nearly escalated into nuclear war. Israelyan is the first Soviet official to give us a firsthand account of what actually happened inside the Kremlin during these three important weeks in 1973. Israelyan's account is a fascinating mixture of memoir, anecdotes, and historical reporting. As a member of Soviet Foreign Minister Andrei Gromyko's staff, he was assigned to a four-man task force that attended the many Politburo meetings held during the war. The job of this task force was to take notes and prepare drafts of letters and other documents for the Politburo. In remarkable detail, made possible by his sharp memory and the notes and documents he saved, Israelyan chronicles the day-by-day activities of Kremlin leaders as they confronted the crisis. For the first time we can see how the cumbersome Soviet policy-making mechanism, headed by the Politburo, functioned in a tense international situation. We see how the actions of Henry Kissinger, Anwar Sadat, Hafiz al-Assad, and other participants in the crisis were interpreted in Moscow. From his own experience Israelyan gives us intimate portraits of top Soviet officials including Brezhnev, Gromyko, and Andropov. His access to important documents--including letters from Richard Nixon to Leonid Brezhnev, never officially released in the U.S.--provide a much-needed corrective to assertions made by Kissinger, Nixon, and Sadat about the war. 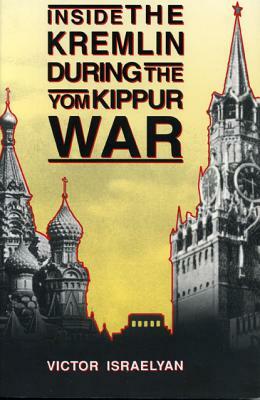 Supplemented by rare photographs and interviews with other Soviet officials, Inside the Kremlin During the Yom Kippur War is more than a record of the past. Israelyan offers a unique vantage point on the continuing Middle East conflict, and his candid assessment of the mindset of Russian leaders is instructive for understanding how the present leadership of Russia faces its new role in the post-Cold War world.